Yellow is the most vibrant shade in the colour wheel. It adds cheer tour bedroom and is an instant mood uplifter. It is a warm shade and goes well with most colors. “Yellow is an interior designer’s delight. 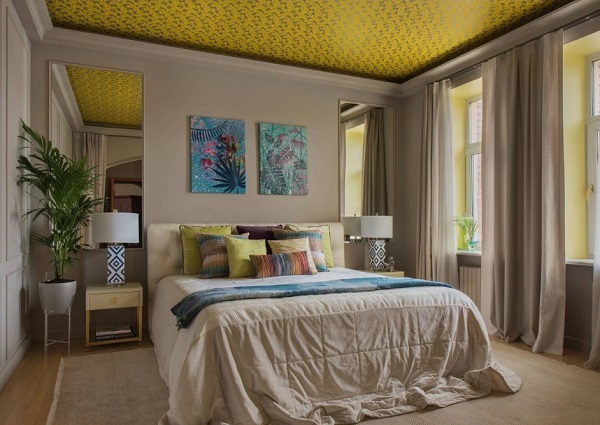 You can create both traditional and modern designs using the various shades of yellow in complementing shades and colours,” says Pooja Bagri of Bagri Interiors. Wheat yellow walls with citron yellow tiled flooring, antique walnut furniture makes for a beautiful ageless patina in your bedroom. This feel can be accentuated with bright yellow accessories like a modern table or a bright yellow rug or even a bright wicker laundry basket tucked into a corner,to create a unique contrast in colour, texture and era in the decor. Pale yellow walls with walnut flooring and a white ceiling can add light and space to a small bedroom. Accents like a yellow quilt and rug add cheeriness and airiness to the end result. White linens matched with the yellow quilt adds to the illusion of space. A bright yellow and white patterned wallpaper on the walls goes very well with a white floor and furniture. Dabs of buttery yellow on the dresser or the side table add the much needed yellow focal points to tie the look together. A bright yellow drape at the window completes the look. 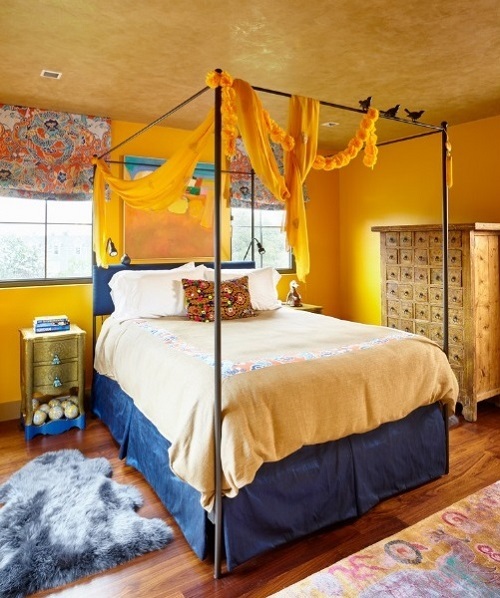 This eclectic mix adds warmth and personality to your bedroom. Warm pastel shades of yellow gel beautifully with white and beige. To avoid a drab look you could use a bright sunshine yellow tufted headboard for your pinewood bed and a bright yellow table in a matching shade to add a bright look. Sage green and blue contrasts very effectively with yellow. 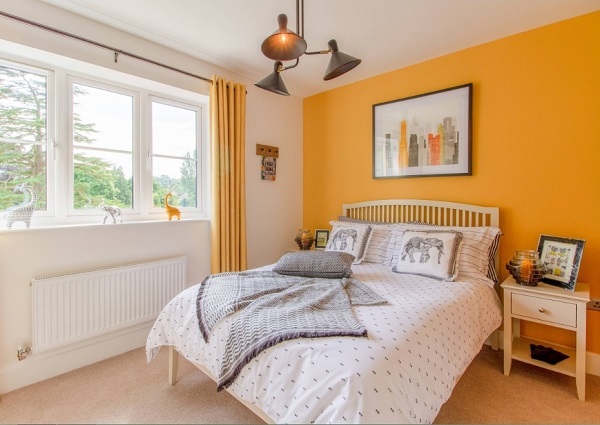 Butterscotch shade of yellow painted on the walls with a slatted effect, wooden flooring and yellow and white bed linens create a cosy space. Accessories like gold sconces and a wrought iron bed creates a simple yet sophisticated look. Effective pairing of colors creates maximum drama in your bedroom. Yellow with black creates a very edgy look. 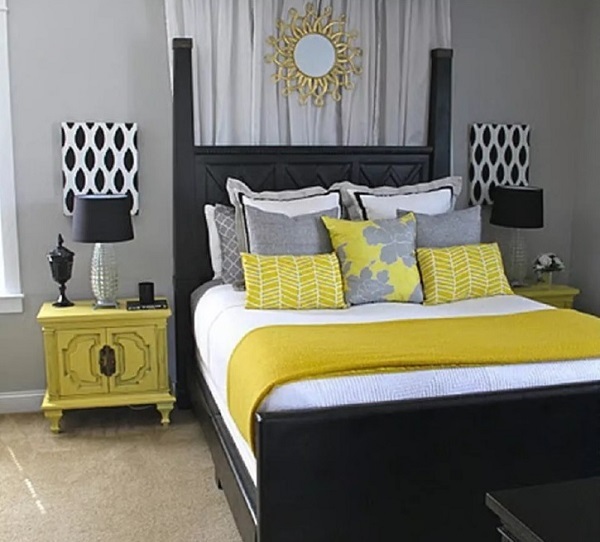 Yellow walls with an ebony bed and dark gray flooring can look stunning. White and yellow striped curtains and bedspreads keep the room from being overpowered. Dark blues pair beautifully with a pale lemon yellow. Lemon walls with dark blue furniture and white or beige linens and drapes with some vivid yellow reflections in the rug and accessories like vases, lampshades or wall hangings create a restful ambience. Yellow is said to stimulate learning. It is the colour of intellect and wisdom. It is believed that a sunshine yellow and white room is the ideal colorscape for a school going child. 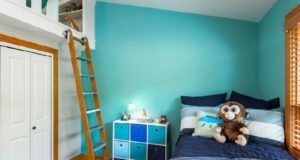 As the child grows older add sturdy furniture in darker shades like navy or brown to match the tastes of the growing child. 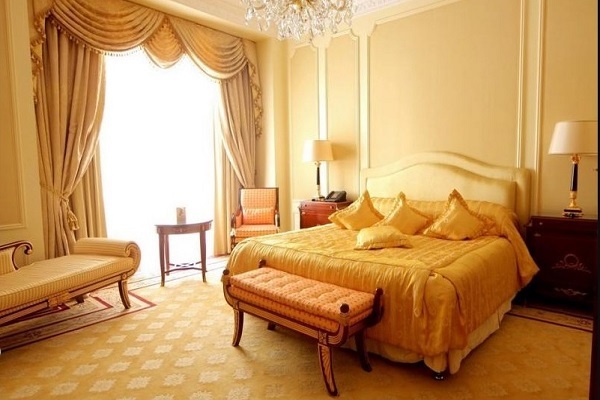 Serene and calm, yellow takes the ambience of your bedroom to another level.